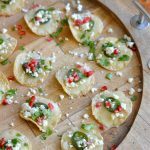 Traditional Texas nachos are given a little bit of festive flair in this eye-catching, easy holiday appetizer that will kick any Christmas party up a notch! Since moving to Texas two-and-a-half years ago, I’ve enjoyed discovering foods that I’d never encountered in any of the other states I’ve lived. From candied jalapeños to sausage balls to kolaches to pimento cheese, it’s been a fun and tasty learning experience. One of the foods that surprised me the most was the “Texas Nacho.” Texas nachos are nothing like the nachos I’d been eating my whole life. To me, nachos meant a giant plate of tortilla chips topped with mounds of cheese, beans, salsa, possibly some chicken or beef, and loads of other toppings. To eat them, you just grabbed a chip from the pile and hoped for the best. Some chips would be completely plain, while others would be so drenched in toppings they would fall apart before they reached your mouth. Texas nachos, however, are different. A true Texas nacho is a tortilla chip individually topped with cheese and one slice of pickled jalapeño. The first time I had these Texas-style nachos, I was sold! Not only were they a lot neater and easier to eat than the nachos I was used to, but I loved that each chip had the perfect proportion of ingredients. Nobody needs to elbow anybody out of the way to scoop up the last bit of cheese. Yep, Texas nachos are a thing of simple beauty. That said, I had to mess with them…just a little! With the holidays around the corner, I wanted to make a slightly modified version of a Texas nacho that would retain the simple sophistication of the original, but add a little bit of festive flair. I found the perfect ingredients at our local H-E-B. H-E-B has become my go-to store to visit any time I want to experiment in the kitchen. They have such a huge selection that I know I can find any ingredient I could ever need. I mean, they even have an entire section devoted JUST to Mexican cheese. 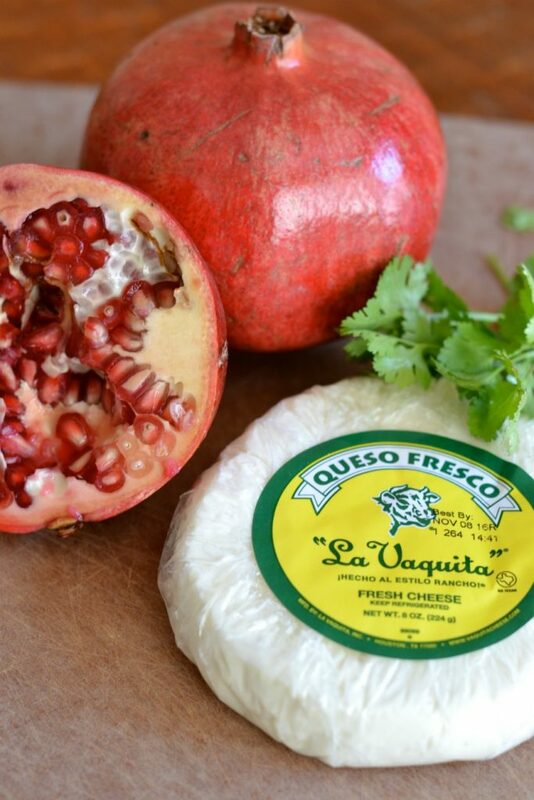 My newest discovery at H-E-B is La Vaquita® Queso Fresco. 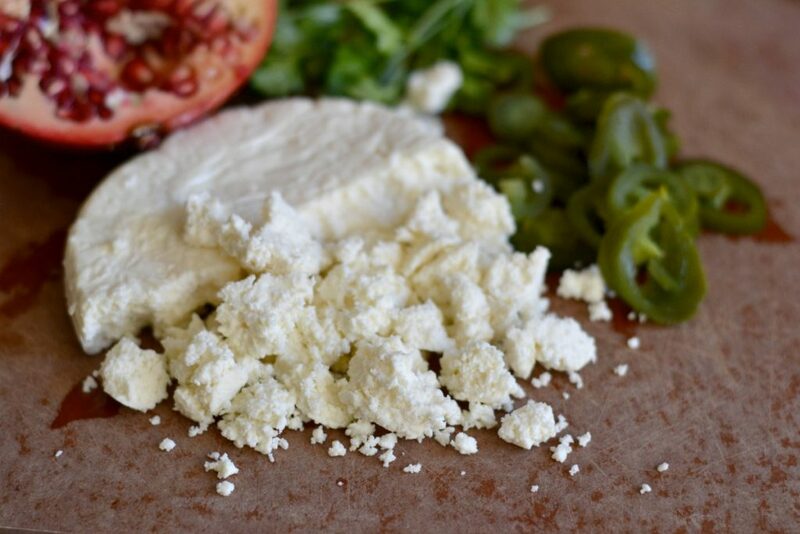 If you’re unfamiliar with queso fresco, it’s not a melting cheese — I like to call it a finishing cheese. You hand-crumble it onto your favorite Mexican dishes as a beautiful and delicious finishing touch. I thought that the white, snowy texture of the queso fresco would make it ideal to sprinkle over my Holiday Texas Nachos. I also added some pomegranate seeds and cilantro because their vibrant colors tie in so well with the holidays, and they add amazing flavor. 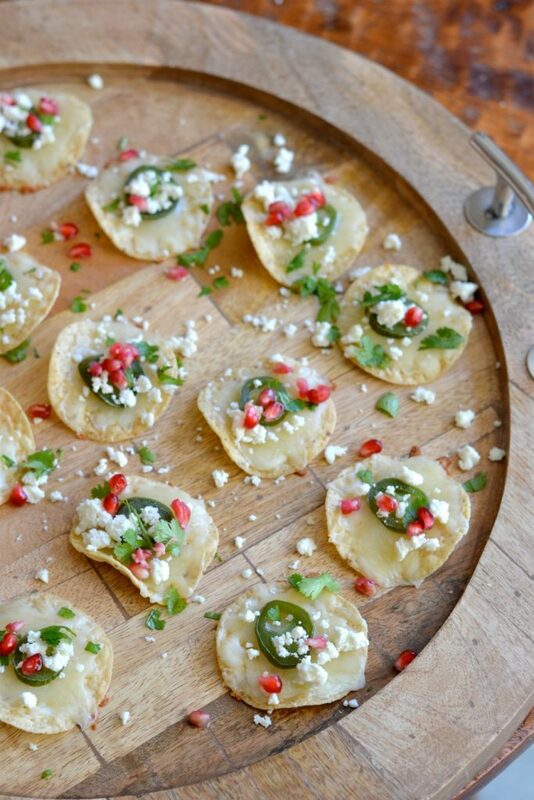 If you haven’t had pomegranate seeds paired with Mexican food before, you’re in for a treat! I’m pretty sure the only thing that could make these better would be to serve them up alongside a pomegranate margarita. 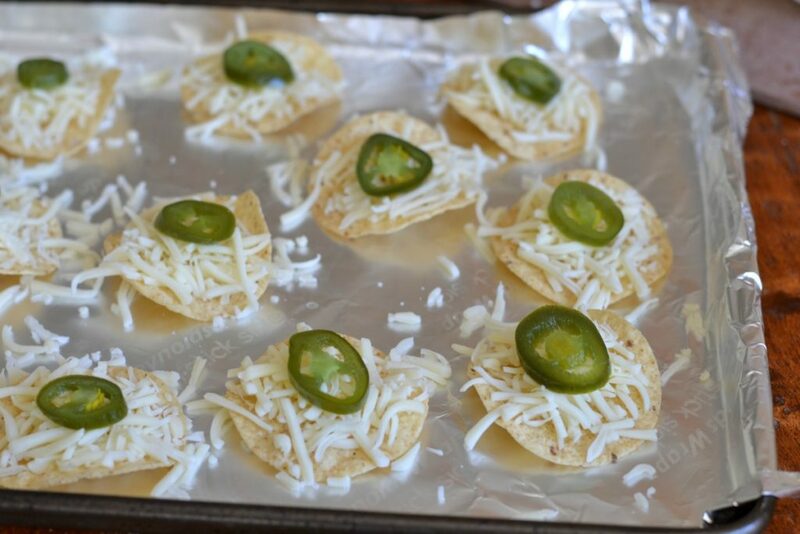 Dress up your nachos, holiday style! 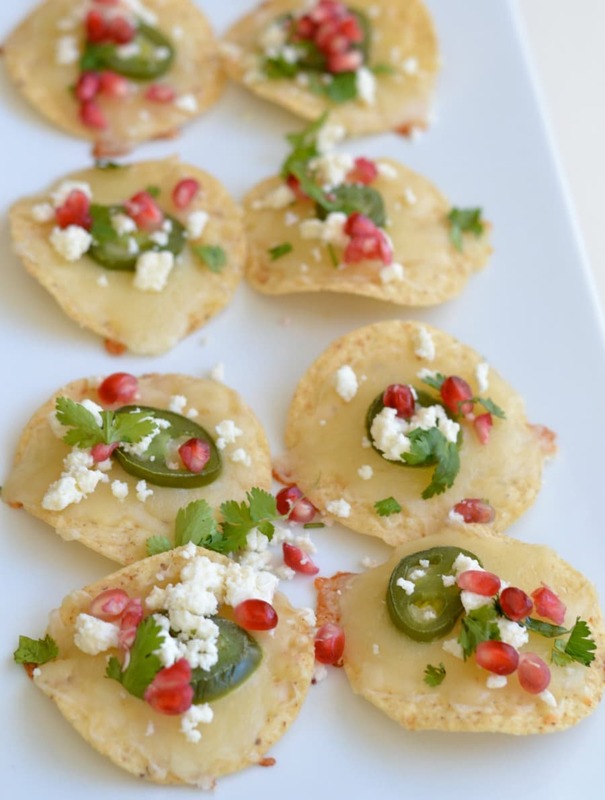 These nachos are perfect appetizer for a casual Christmas party. Line a baking sheet with foil and spread chips in an even layer. Top each chip with shredded quesadilla cheese and place one pickled jalapeño slice in the middle. Bake at 350 for about 5 minutes or until cheese is evenly melted. Remove the chips to a serving platter. Crumble the queso fresco by hand over each chip. Sprinkle on chopped cilantro and pomegranate seeds. To learn more about La Vaquita® cheeses, visit LaVaquitaCheese.com or check out their Facebook page. Ibotta has some great offers as well. My husband would love these! I’ll have to make them for him, thanks for sharing!